Our Founder & President Tink Taylor is always on the move, attending high-profile events and conferences across the globe. On this blog post you can follow his journey and check out what he’s been up to. Straight off the bat, following the very exciting inaugural dotmailer Summit, I immediately jumped on a plane to support our APAC region with some very exciting events. I was delighted to speak at the very first Shopify Meetup event in Sydney, held at the amazing Fishburners (think this is Australia’s equivalent of We Work). We were surrounded by a vibrant tech community with a real thirst for knowledge. The place was packed to the rafters with over 250 in attendance and another 250 on the waiting list. An amazing turnout considering this was the first time this event has been run – and especially for the wettest Thursday night I think Sydney has ever seen … where were all the dotmailer umbrellas when I needed one! Having just launched our Shopify for dotmailer integration, it was great to take stage first and give the audience a flavour of dotmailer, what we can offer Shopify users and how merchants can leverage our feature-rich platform to drive their revenues. I was followed on stage by fellow speakers Dave Taylor, who’s the Founder of numerous online businesses including Cracka Wines. He told his great story of his migration from an in-house system to fully fledged ecommerce platform like Shopify. He detailed the pain points it resolved and how he financially modelled the savings he could make by doing so. Jonathon Lowe, a product designer from Breville, gave a great insight into how products move from concept into design production. Last but by no means least, Jacki Bresic of The Agncy (yes that is how it’s spelt) ran through lots of examples of how retailers had used social media to drive traffic to merchants’ online stores. Following the speeches and a few networking drinks, the team took stage for a panel discussion. I don’t think I’ve ever been part of such an engaged audience. With so many questions and everyone keen to know more, we overran by nearly an hour and a half! The discussion soon turned to multichannel marketing and how email binds all the other channels together. Interestingly, the feedback from the retailers in the room was that Facebook was dead to them and it was all about Instagram when it came to social-driving traffic that brought business. The event was a massive success and congratulations to Bodog Olah of Createur.com.au, who organized the event and the social afterwards. It was a pleasure to spend time with the extensive team from Shopify. As the sun came up, I was off to the airport for a very early flight back to Vancouver. Bouncing through San Fran on the way home meant that I had actually circumnavigated the globe in the last three weeks! There’s now just a few weeks to put the final preparations together for Magento Imagine, their flagship annual event in Las Vegas at the beginning of April… more on that next time! Online Retailer, An event that has traditionally switched between Melbourne and Auckland, provided us with a great opportunity to meet with so many retailers in the region. The feedback on the Auckland location that this was an exciting event and all signs look like it will remain in this city from now on. The event was full of practical tips and takeaway advice that retailers can implement immediately. It was a great opportunity for us to show these ecommerce brands some fantastic examples of what dotmailer customers have been doing across the globe. It was an inspiration to a market that is still finding its feet in the world of digital in some respects. Having said that, there were plenty of examples from the event of retailers who have shown fantastic growth both locally and in the global market, which was an inspiration for all. The key messages were about understanding your consumers by creating a customer-centric culture and embracing a multichannel vision; this includes making your email marketing stand out by leveraging your data collection and analytics. The event also provided me a first! Rohan Lock, our APAC Regional Director, was asked to host the event and for the first time in over 10 years he’s been with us and had the opportunity to welcome me on stage! It was then time to pack up and head back to Australia. It was a hectic week looking at the operational team’s plans, and meeting clients and partners. It was great to hear that in the last month or so, we have signed up three new partners across Singapore and Indonesia. I also had the pleasure of meeting the new Magento team that is now physically based out of Sydney. The Magento guys have been extremely busy recruiting within the region, with more to follow I hear shortly in Singapore. The Sofitel Wentworth Hotel in Sydney welcomed the Retail Leaders Forum: an exclusive strategic event attended by over 500 board and exec-level retailers. I was delighted to join the stage to give the lowdown on dotmailer and participate in a panel discussion; I was on the panel with Mark Coulter, CEO of Temple & Webster and Hilton Seskin, Owner of Next Athleisure, who operate in the youth apparel industry through Glue Store and Trend Imports. Hilton also has franchise rights to operate the Topshop down under. The panel was ably chaired by James Lush, Founder of Lush Digital Media. We discussed impactful retail and what leadership and strategy is required at the top in today’s fiercely competitive global marketplace, where retail executives are constantly reviewing customer engagement and navigating borderless retail. We looked at what retailers can learn from start-ups about optimising resources, building a reputation and fostering innovation, and, in doing so, how retail leaders can be proactive rather than reactive in their planning and decision-making towards growth. It was great to meet so many retailers, new and old, along with a few of our technology partners. The message from the event was loud and clear: strong leadership is extremely important as competition is intense. One-to-one engagement with customers is more important than ever; it’s time to move away from batching and blasting to maintaining customer satisfaction in Australia, and while big data is available to deliver this, it is very important not to forget getting the basics right. The last month has been a whistle-stop tour of the world. First stop: London! My main reason to visit London of course was our inaugural dotmailer Summit, held at the Grange Tower Hotel in central London. I couldn’t be more thrilled to open the summit with my fellow co-founder Simon Bird. We were extremely proud to be on stage to welcome so many customers and partners who had travelled from all over the world to be there. I recall sitting down some time ago with Phil Draper, our CMO, to discuss launching a Summit. The rationale was simple: many people in the UK wrongly assume that we’re simply focused on the SME market. This is a legacy assumption, because our product and services have developed significantly over the years. The platform itself is deeper and broader in terms of sophistication and capability than ever before. So, the task was to put on a summit that would make people stand up and notice. At a time when a conversation about Brexit is not far from everyone’s lips, it was time to ‘be less British’ and chest pump a little about what we can do and who we are. We learnt a little about doing this during our time in the States, further demonstrating how over the last 18 years we’ve moved from a small business serving SMEs to a global player working with the mid and lower-enterprise markets. This is not only in the B2B CRM space but also in the B2C ecommerce world; we now find the two rapidly colliding through the rise of B2B commerce. In the morning it was a delight to welcome on stage our special keynote speakers Rory Sutherland, Vice Chairman of Ogilvy Group UK, who gave us great insight into the psychology of marketing. An amazing character; if you can laugh and learn at the same time, you know you are onto a winner! Rory was followed by Touker Suleyman from Dragons’ Den and needs no introduction! He discussed how to make brands truly customer-centric. Shar VanBoskirk from Forrester Research then took stage. Shar, who is probably one of the best-known people in digital marketing globally, took us through the latest multichannel strategies that will drive tomorrow’s results. The group of keynote speakers then joined Simon and me for a fascinating panel discussion on Artificial Intelligence and what it means to marketers today and in the future. The day also saw numerous talks from our very own special dignitaries, such as Client Services Director Skip Fidura, CMO Phil Draper and CPO James Koons. We were delighted to host industry veteran Dr Dave Chaffey along with some clients who shared their experiences and learnings, including Fred Perry, Barbour, Slendertone and Copa Airlines (who flew in from Panama no less). The day was wrapped up with an inspirational speech from double Olympic gold medallist James Cracknell. If you ever need to know how to set and then smash your goals while working with different teams, go listen to James! The day of course wouldn’t have been possible without two special groups of people. Firstly, our strand sponsors –Magento and Kickbox – and our supporting sponsors: Trustpilot, Klevu, Smart Impact and Fresh Relevance. And finally, our marketing team… I said the task was simple! It was anything but simple to put on such a very special event. When I first sat down with Phil we didn’t imagine that we’d have had 560 people in attendance, with a waiting list as long as your arm, so many amazing speakers and an amazing venue covered in dotmailer branding… and not forgetting a life-size version of Winston the Watchdog! There are too many to name individually but a special thanks to Amie, Mark, Phil and Skip who put in a massive amount of effort, along with the rest of the team. The event was slick and professional; the feedback has been nothing short of extraordinary. It made myself and Simon immensely proud. We will be back bigger and better next year! Don’t worry if you missed out: we are taking the learnings from the Summit on tour, with events planned for the UK (Birmingham, Manchester and Bristol), Australia (Sydney & Melbourne) and the USA (NYC, TBC). Keep an eye on our events page for more information. I arrived in a NYC that was basked in the heat and sunshine, and which was a nice change from the snow in Vancouver. It was awesome to again help out with the numerous events that are now being held in our NYC office; this time it was for the New York Internet Marketing group. A fantastic group of experienced professionals attended the Meetup – some from small businesses and start-ups to those from large organizations, including the likes of Johnson & Johnson. We received some great comments after the event. We went through what automations could benefit marketers; I don’t think I’ve ever spoken to such an engaged audience! It helped that we made the event really interactive, with Q&As throughout the session. Sadly, the next day the heavens opened and snowy NYC returned, which led to the cancellation of our next event with Fulcrum Technologies… Keep an eye out on Twitter for the rescheduled event. However, every cloud has a silver lining and it gave me the opportunity to visit a different event hosted by decoded.com. It provided a fascinating journey on the history of cyber security; for those concerned about this area – even on a personal basis – I would recommend checking out their site for some handy hints and tools that you can use. It was also great to see another UK-born tech company growing nicely in the US, via NYC. The rest of the week was jam-packed with back-to-back meetings, as we busily prepare for the upcoming conference season. Plans are being hatched for Magento Imagine that look great (and did I really sign up with the rest of the team to do the 10k run from Vegas to the Hoover dam?!) I encourage anyone else attending to do it with me – here are the details. Speaking of conferences, don’t forget the upcoming EEC conference in New Orleans – it’s taking place from May 1 – 3. And remember that it’s not too late to nominate your peers and colleagues for the EEC awards. It was great to see the UK team launch 17one last week. One of the biggest announcements was the long-anticipated connector for Shopify. There was a flurry of activity in the office as the team prepare for the Shopify Unite event on the West Coast. Sadly, I’m not able to make that one, as I will be back in NYC for ‘England Day’ … more on this later. The week of January 16 took the team to NRF in NYC, our North American home! The NRF (Nation Retail Federation) is a three-day event offering unparalleled education, networking with 35,000 delegates and an enormous EXPO hall full of technologies and solutions. The show was a first for dotmailer and I was surprised at how big it was and how global it was; I didn’t have to turn many corners before bumping into familiar faces from Australia. It was great to see how well respected the Australia retailers were and how recognized they have been for their commercial endeavours. The dotmailer sales team from NYC were super busy giving demo after demo to numerous folks, both new partners and merchants. The big question was why did the show start on a Sunday and then continue on a Bank holiday Monday. The best assumption we came up with was the legacy of the show, which has been running for decades and where trading would have not been allowed or limited on Sundays and Bank holidays. Either way, it didn’t affect attendance and the second and third days were especially busy. We wrapped up the show by putting on an amazing cocktail reception with our partners Temando and Addressy. Again, it was awesome to share and introduce contacts that were extremely relevant, while enjoying a branded drink or two. The following day we went to the Partner Kick off at the Hyatt Regency. This was a great opportunity to hear a first-hand update from the senior Magento executives. It was good to see the traction they have been getting over the last 12 months, and to see some insight into the roadmap for this year. The event also provided invaluable one-to-one time with the various team members from sales, customer success, marketing and the board. This has enabled us to map out some great plans for 2017. Of course, the event provided time to spend with the Sis; many old friends as well as meeting some new ones. 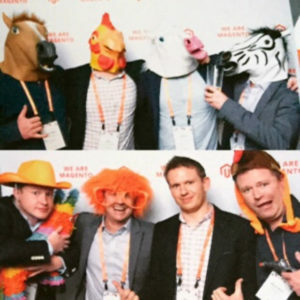 The day was rounded off back in Manhattan; this time at the country club, where Magento threw one of its famous parties to say thanks to all the partners. Again, this was a great opportunity to network with both Magento themselves and the folks within the ecosystem. As an amateur magician (don’t ask!) I was super impressed by the magic act they put on, even knowing possibly how we has doing things I didn’t get close to spotting it… he was amazing and had all the patter of a seasoned pro from LA! How do you follow that for a success day? Well, that’s easy: the team were delighted to be invited to Magento’s Global Sales Kick Off, held at their current HQ in Culver City. We are very grateful to the team at Magento who enabled us to present dotmailer to the entire sales and customer success teams. This enabled everyone on both sides of the table to understand how to better describe how our technologies complement each other. To make sure everyone was paying attention we did a quiz at the end. The prize… simple: the new dotwatchdog. We only had a handful left following the Partner Kick off. That dog is hot property – get your hands on one while you can!! We also got to spend some quality time with our co-Premier partners, including the likes of PayPal, Nosto, Temando and TaxJar. Watch this space… many plans were hatched on messaging and activations where we can be working together this year. For those who don’t know, Magento has eight Premier Technology partners, including dotmailer. These are partners by invite only… by merit not credit! This represents a significant change Magento-wise. Over the years it has seen their merchants install a variety of plugins from their partner ecosystem. Some good, some bad: imagine having to use ten plugins on your site; this would mean 3-star software vender reviews for each one… that’s 30 pieces of software to research… and sometimes still make a wrong decision. Magento has carefully vetted and audited their partners so they can recommend them with confidence to their merchants. We as a group are the partners they know will make a difference in delivering results. To wrap up the event we were delighted to take several of our SI partners, their clients and prospects to see the LA Clippers. I profess, originally being from London, that I don’t know much about basketball, but I was thrilled to see ‘The Sugar Hill Gang’ perform ‘Rappers’ Delight’ at half time… an all-time classic! On Sunday January 8 the dotmailer team rolled into LA. It was a great opportunity for the team, which is spread across North America, to catch up for the first time in the New Year. We’ve recently brought Ben Staveley over from the UK, who has worked in many roles within the organization – from dotmailer sales before moving into what was known as dotAgency. This was our Silver Magento SI that had formerly been a software vender and had built a product called dotCommerce. dotCommerce was part of our overriding portfolio of companies called the dotdigital group; this was all long before we had 100% focus on dotmailer and email marketing. When we did decide to put all of our resources into email, Ben naturally gravitated into our product team, where he has until recently been working as a product manager (specifically working with the team managing our Magento connector). It’s the likes of Ben, and the rest of our agency team who moved over to dotmailer team, which give us a such a strong heritage and understanding of ecommerce. Not only do we understand what it’s like work with retailers, we know what it’s like to be a software vender and also an SI. It’s this rich legacy in ecommerce that gives us the edge, meaning we have the best email marketing integration into Magento. Ben has taken over the reigns of the dotmailer/Magento relationship, freeing up Jonny Dixon who had been doing a great job along with managing our channel team. Both Ben and Jonny worked together at dotAgency and many other roles during their time with the business. Jonny will now have more time to work with the partners, in the knowledge that his old partner in crime is working closely with him on this and numerous other key industry relations. It’s been a very busy few weeks, all starting off with business networking at the British Consul’s Residence in New York, of which I was invited by the Wetherby-Pembridge School; the school is opening on the upper east side of the city in September 2017. The event at the consulate fosters networking among numerous British and American companies. It included a fantastic speech from The British Console General, Antonia Romeo, who praised the school after sending her own children there when she was based in London. The following evening we were delighted to welcome the Magento Meetup to our dotmailer NYC office. The event was hosted by our very own Ben Staveley, who was recently promoted to VP Operations. After a recent assignment to assist the New York team, it was clear that his knowledge, skills and can-do attitude will greatly assist our ambitious US growth plans. Ben has moved permanently to New York and brings with him many years of experience in a variety of roles within dotmailer, more recently as a Senior Product Manager. Ben will also build on his relationships with Magento, working closely with the company’s senior team and our channel team on making the most of the special partnership we have with them. Ben was delighted to invite the senior executive team of RJ Metrics. They came along to give some background on their offering and explain why Magento recently acquired the business, and what ‘Magento Analytics’ means for retailers. What next… you guessed it, another event! This time dotmailer hosted its first dotlive in NYC. The dotlive events, if you’ve followed the hashtag, are educational events that have achieved great success in the UK. They cover all aspects of email marketing and are now widely regarded as one of the go-to events in our industry. To kick off these events state side, I was privileged to welcome our very own Chief Privacy Officer, James Koons, onto the stage. James gave our attentive audience a run-through on what deliverability is, what it really means, how it’s measured and by whom. Of course, it also involved telling the folks what we as dotmailer do, in terms of the technologies we use, the ones we have built and processes we follow, along with explaining the tight industry relations we hold with the receivers. James also gave us his personal journey on how he came to be living and breathing in the deliverability space… If you ever get time it’s well worth listening too… from being part of the US army that featured in the movie Black Hawkdown, being one of the first employees at Amazon and also being a lawyer… it’s a fascinating story in itself! How do you follow that!! Well, the next day we entertained Martyn Body of Shopify in the office. Martyn ran the team through the Shopify offerings and explained the differences between the standard and enterprise versions (Shopify Plus). It was interesting to hear the strategic direction of such a fast-growing company, especially its focus on the ecosystem of technology partners that are building around the core platform. This is something dotmailer is very interested in, seeing as we release our first ever premium Shopify integration, estimated for release in early February 2017! The week provided numerous opportunities to meet with key existing partners, along with some possible new ones. Some very excited opportunities are looming on the horizon! It also gave me some great face time with the team who are busy making their plans for 2017; there were lots of discussions around upcoming events like Magento Imagine, and the work we are doing with our key tech partners like Magento, PayPal, Shopify, Salesforce and Dynamics. It wouldn’t be Christmas without a party. We capped the week off with a great team dinner and drinks at our favourite watering hole in NYC, the Churchill Tavern. If you are ever in NYC and fancy a pint, we thoroughly recommend it – especially listening to the speeches of Winston Churchill that are piped into the restrooms! It was a great event and we were joined by some of our key partners in the city after. As I reflect back on last year it is amazing to see how many new faces there are in the US operation and how much we have grown under the leadership of Dan Morris; it’s very exciting to see. I had a quick week in Vancouver before heading to London for the company’s AGM. That will be it for me for the year, so I can enjoy the opportunity to visit friends and family in the UK over the holiday period, before jetting out for another exciting year of helping dotmailer with its global development. Thanks for listening and let me take this opportunity to wise you all a very happy Christmas and a successful new year. Happy Holidays from me and the dotmailer North America team! Last week saw another brilliant Magento Live event, made even better by the date’s significance. We’re now one year on from the official announcement of dotmailer as their first Premier Partner, and we’re still the only global Magento partner for marketing automation! It was great to see a notable increase in the number of Magento staff from their head office in attendance, including all Senior team members. They were gearing up for a full-on Asia tour: a Magento event in Japan, followed by a partner recruitment event in Singapore, before finishing with MagentoCom in China, organised by our friends at BlueCom. So it was no surprise that a lot of the talk at the conference focused on Magento’s expansion into APAC, recruiting for a physical presence in Australia and Singapore. Obviously the event saw a lot of discussion around Magento 2, and the traction it is getting. The stat that really stood out to me was that 42% of M2 downloads are coming from Asia. It’s awesome to see them growing successfully! It was also great to spend some time with the team at RJ Metrics, Magento’s new Analytics acquisition. They’re currently busy in conversation with our product team at the moment, so watch this space! Another huge topic was the Magento Cloud, a fantastic solution for retailers looking to streamline the number of vendor contacts they have to worry about. I was delighted to see dotmailer client Oliver Sweeney, via our partners RedBox Digital, highlighted as the global first Magento Cloud site. Check out the casestudy to see the brand’s Magento story. As ever, events like these are a great opportunity to network with our partners, existing clients, and new prospects. It’s amazing to see how far we’ve come; three years ago, no one in Australia had even heard of dotmailer; in 2015, the room was full of newly acquired partners; this year virtually all exhibitors were SI or technology partners who are actively working with and selling dotmailer. The event was topped off by the traditional Magento party at Café del Mar, Darling Harbour – some great conversations were had amongst spectacular views! This year saw a much appreciated addition to the party proceedings. In previous years, it was noted that retailers and partners alike wanted more. Not one to be outdone, dotmailer were delighted to hold the after-party, in conjunction with partners SLI Systems, Netstarter, and Temando (a Magento Premier Partner). The bash was held slap bang next to Sydney Harbour Opera House, providing great networking for all involved – with a spot of dancing thrown in, curtesy of one of the greatest event bands I’ve ever heard! It was great to spend some time with the hard-working team in our Melbourne office, my first visit to our new physical touchpoint in APAC. The highlight of the visit was undoubtedly the private dining event held in conjunction with our Partners Balance Internet – now an automatically occurring event in my calendar for every Aus trip! Held at Matteos in Fitzroy – one of the best restaurants in Melbourne – the dinner was exquisitely organised by the BI team. With numerous retailers (both prospects and clients) invited we held an engaging and informal fireside chat during dinner. This time I was delighted to be joined in stage by Luke Fossett (Head of Market Development) of Braintree & Andy Baker (Director Strategy & Growth Global Payments) of Magento. Luke and Andy discussed the trends in payments and how the landscape is changing across APAC, including some of the risks to security & privacy. I was some particularly relevant questions which I want to take a moment to answer again here. How are retailers using marketing automation to increase conversion? These campaigns are just the beginning; check out our best practice guide: Growing your ecommerce business with email, for the low down on the essential emails you should sending. How can marketing automation be used to counter abandoned cart behaviour? Forrester tell us: 90% of cart abandonment leads go cold within 1 hour, and every extra minute reduces your conversion rate. Email 1: Sent within the first hour, this email geared towards service; ask if there was some technical error that forced the prospect to abandon their cart. Email 2 – Sent a day later, this campaign should be benefit led. Email 3: Send this a week later; include an offer or a warning that it’s the last chance to retrieve their saved items. MarketingSherpa tells us that 29% sales are recaptured by a 3 step program, so what’s to lose in giving it a go? Where do payments and marketing automation meet? What will happen in the future? This answer is simple: we are seeing more and more inbox innovation. The ISPs (Hotmail, Yahoo, Gmail) had, until recently, undergone no significant changes. However, in the last year or so, we’ve seen some real technical innovation by these guys within the email client. This means that more functionality is becoming available. For example, (and this was an event exclusive) Paypal now allow ‘Buy now’ buttons functionality within the inbox. In our new release, launching this week, the ability to add these buttons will now be available in our Easy Editor UI. There are some limitations; for example, the Paypal in-inbox purchase is only available for single products (so postage is at a premium!) However, we expect this to change as rapidly as the functionality is adopted by users. Of course, Paypal aren’t alone. This kind of integrated technology will become more familiar in due course. Interestingly, Apple Pay is gaining traction in a similar space. One thing’s for sure, email has the capacity to adopt lots of great new tech features. So it was back to Sydney for the last of the big events of this trip, held at the incredible Ivy Pool bar. The venue was perfect for pre-Christmas networking drinks with all of our active partners in Australia, and a terrific way to thank all of our partners who have worked so diligently and positively with us this year. It was great to see so many folks in attendance and, whilst it was time to relax and celebrate the last 12 months of work, the excitement of all involved facilitated a lot of business chat. It’s really exciting to see the level of traction that the Australian team is getting and the progress that’s been made so far! Murdo Wallace – heading up operations and working closely with tech support teams, alongside another recent hire in Sydney, our 3rd line tech support Navneet Sharma. It’s exciting to see Beatrice Ellefsen join us from our London office; she comes with 5 years’ experience of our Key Account Management team and has already cracked through loads of work with our key clients and partners. Let’s not forget to mention Paula Harrison; she needs no introduction to most in APAC having joined us from her previous role of CEO of APD (Asia Pacific Digital Group). Paula is busy helping us with our strategic alliances as we advance into Asia. The Sydney office sports a pair of signed Muhammid Ali boxing shorts with the tag line ‘I am the greatest’ – the perfect testament to the, depth and experience of this team, who work under the stewardship of Rohan Lock, himself a 10+ year dotmailer veteran! Expect plenty more from Aparna and the Aus team in 2017! Firstly, it was really good to be back in my home town and also a pleasure to be invited to speak here. I enjoyed catching up with the dotmailer Product Team and they were super-excited to hear how well the platform is being received globally. It’s really promising when you realise that the piece of technology you’ve created is loved by businesses of all shapes and sizes around the world, and it’s awesome to come home and share that feedback. Anyway, the OroCRM event was hosted at dotmailer’s HQ; we have a great relationship with Oro and have worked on a few joint projects together over in the US. The founding team at Oro, including Jary Carter, were also the co-founders of Magento. On stage along with myself and Jary were Chris Raven from Allies and Certainly Wood’s Natalie Sadler. This event was designed to help one of our key partners go international and get some exposure in the UK. We’ve worked with our partners to do this previously, including Redbox Digital who were based in the UK and who we’ve exhibited with in Dubai to help expand each other’s presence in the Middle East. It’s great that we’re able to help out our partners using our global grounding. When I met Prince William, he asked what I did for a living and I told him that I was once of the founders of dotmailer. When I asked him if he knew what dotmailer did, he responded with ‘Is that an email marketing automation platform that enables you to send the right message, to the right people at the right time?’ I responded with surprise and asked how he knew; it turned out that his mother-in-law uses dotmailer and he said he’d be in trouble if he didn’t know what she did! My visit to London was rounded off by speaking at dotmailer’s company-wide All Hands meeting, where I shared updates and news with the entire team. 1,200 people attended Meet Magento in Ho Chi Minh City. This is the second-largest Magento gathering outside Magento Imagine in the US. It was a very well organized conference and I was delighted to be invited to speak alongside some big names, including Jerry Smith, the President & CEO of OgilvyOne APAC, the founder of Mercurial, Matias Orlando, and the Founder & CTO of QuarticON, Pawel Wyborski. I was delighted to be part of the panel discussion around launching an ecommerce website. My presentation on the top 10 email programs for retailers went down a storm, because it really resonated with partners and merchants in this space. I felt like a bit of a celebrity afterwards – I had people coming up and asking to take selfies with me! The attention didn’t stop there, as I was also interviewed by Vietnamese television broadcasters such as VTV News. The size of the opportunity for technology companies like us – and online retailers – is that the maturity of ecommerce in this region is nothing like that of the western world. Retailers are bypassing the high street and are leaping straight online; as such, they’re looking for the best-of-breed tools that’ll enable them to act fast and scale quickly. That being said, some of the challenges facing the Asian market appeared to be streamlining and smoothing out issues with things such as the logistics around payment on delivery. Meet Magento was also a great social and networking opportunity, and it was particularly nice to bump into some of our Vietnamese customers on the booth. All in all, dotmailer enjoyed some great exposure at a well-attended event. Dreamforce is a beast – there’s nothing else quite like it and it really does take over San Francisco! This year there were 170,000 attendees, and more than 5 million people tuned in online. The big piece of news at this year’s conference was the launch of Salesforce’s Einstein product, so there were some really nice Artificial Intelligence stories being told. It was also great to see that the ecosystem is alive and well, with the exhibitor hall as busy as ever. It was clear to me that there were three kinds of customer attending the event, and it’s promising that we’re able to help and add value to two of those distinct groups. dotmailer is well-suited to both larger SMEs and mid-market customers who want their marketing to be more sophisticated and deeply integrated with Salesforce, but without the big price ticket for the software and service. In fact, let’s use an analogy to try and describe where I believe dotmailer fits into the marketplace. If we were to look at boxers Tyson Fury and Floyd Mayweather, we might compare dotmailer to Floyd Mayweather, because he’s the best pound-for-pound fighter; he represents performance and value for money. Whereas a heavyweight fighter like Tyson Fury can provide the biggest knockout blow, he represents a big and expensive stack like Salesforce. Large-scale companies with huge volumes of data are well-suited to that all-in-one kind of solution. And it’s those smaller businesses, who feel as though buying a tech stack would be like purchasing an expensive hammer to crack a nut, that really see the value in our offering. I found that there were companies using weird and basic email systems I’d never even heard of, because they didn’t think there were alternatives like dotmailer. Of course, I can’t sign off without talking about the social aspect of Dreamforce, because it’s also well-known for its nightlife. And with so many events going on it even has a dedicated app called Partyforce, just so you can keep track of all the events being run across the city every night. But no party were bigger than the main event: U2! They played before 170,000 people in a giant open-air stadium. Bono and the Dreamforce team were there representing the ‘Red’ foundation, an AIDs-related charity (founded by Bono). $1 million was raised during the event; Mark Benioff pledged to double that with his own money and Melinda Gates also said she would do the same. So not only are masters of Silicon Valley making money, they were also busy giving it away. More than 5,000 attendees and 200 exhibitors gathered at this year’s Shop.org summit. We didn’t exhibit, but this gave us an excellent opportunity to take along our Channel Team and spend time with our partners. We also held a partner event that was attended by around 40 people from 15 partner companies across the US. In fact, it took place on the night of the first US presidential election debate! The guys reported that there had been a slight pause in the development of Magento sites while M2 was bedded in, however they now have a continual number of projects rolling in especially as Magento 2.1 has now been released. It was great to hear how happy people are to be working with dotmailer and the Magento integration, and promising to realise that we’re becoming much more well known in the US market. That’s all thanks to the hard work of the team and their achievements in growing our presence over the last three years. The Online Retailer Conference & Expo is Australia’s largest and most trusted technology-driven retail event, and attracts buyers and decision-makers from online and omnichannel retailers. It was great to speak and be a part of the panel at the event, which took place in Sydney. I was also on stage with NORA, who is the industry body representing direct-selling companies in Australia. In fact, it was during this event that we announced dotmailer would now also be selling direct to customers, as well as through our network of local partners. Our agency partners in Australia are extremely important to us and have been instrumental in helping us to grow our presence in the APAC region. So much so, that my speech to Australian retailers was themed around our agency partners, such as Salmat. I had a busy time while down under, as I also flew up to a private event with Balance Internet, which was in conjunction with Braintree Payments. I think one thing that was really apparent at the end of my trip is that the Australian market isn’t as behind in terms of ecommerce as they think they are. And when I say behind, I mean in comparison to the UK and the US. In fact, I think they’re at an advantage, because they have the hindsight of the UK and the US’ mistakes and aren’t burdened with legacy systems.